I do love me some personal branding. This is a very competitive business. Anything you can do to give yourself an advantage and make your sites get noticed will make a big difference. One of the easiest ways to do this is to personalize your business with your own unique brand. Your unique personal brand can be your own picture. It doesn’t get any more unique than that. The guys at TimTech know this and have been championing the idea of personal branding for years. Now they have taken personal branding to a new level with the relaunch of their ThumbVu traffic exchange. The new ThumbVu design is clean and fresh and it offers a new concept in traffic exchange surfing. Instead of viewing random websites for hours on end ThumbVu members are now presented with a list of other members giving you the option of choosing who’s website you want to view next. This is a great opportunity to connect your personal brand with whatever you are promoting. Members also have the ability to leave feedback on your pages. Do you think having this kind of feedback displayed every time your site is shown will help you get more sign-ups? Lots of people will be flocking to ThumbVu this week to check out all of the new changes. If you are already a member now would be the perfect time to login and assign some credits to your sites (and to your personal brand). If you’re not already a member of ThumbVu… what are you waiting for? Click the banner below to join. About a year and a half ago I did a video walk through of a new site at the time called TE Command Post. TE Command Post continues to be one of the most useful services for traffic exchanges surfers that I have ever used. When you are a member of dozens of traffic exchanges like I am it becomes extremely helpful to keep track of all of your credits on all of your traffic exchanges with just one click. This past week TE Command Post added a new feature which makes it an even more invaluable tool… the ability to track all of the commissions traffic exchanges owe you. Check this out: According to TE Command Post I had over $400 in commissions owed to me that I had not yet received. Now some of these sites do pay monthly and I just have not been paid yet this month. List Surfing is a good example of this. But many other sites require you to login and manually request your commissions be paid. If you don’t know you are owed commissions you never get paid. 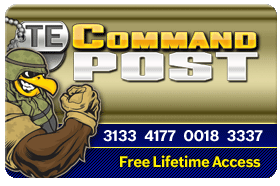 Just another reason why I believe TE Command Post is an essential tool for all Internet marketers who are promoting with traffic exchanges. If you are not already a member then sign-up, select your traffic exchanges, and find out immediately who owes you money. The calendar on my wall says it is February but the thermometer is making it feel more like May. Regardless of what the weather may feel like outside it’s time for another fun filled blog post revealing my top safelists and viral list builders. That’s it for the news. Let’s get to the stats! Every day I promote a number of squeeze pages using safelists and viral list builders which give away free copies of my ebook Safelist Marketing Tactics. I use a free link tracker to determine how much traffic my mailings generate as well as how many new subscribers I receive. I then compile all of that data and share the results here on my blog each month to show you which safelists and viral list builders are bringing me the best results. I always like to point out that I do have upgraded memberships at most of these sites which usually allows me to send my ads more often. My ads are also very targeted to other safelist members which does help to increase the response rate. Your results my vary. Congrats to Viral List Builder Plus for making it to the top of the list! A big thank you to List Hoopla for recommending Your EZ List to me. It’s not the sexiest list builder out there. In fact it’s about as bare bones as it gets. But so far the results have been excellent. Looking at the stats I also want to mention that I recently let my upgrade at List Joe expire. It’s always been a relatively expensive upgrade which was well worth the price about a year ago but with all the new viral list builders it’s effectiveness had been going down. Oddly, now that I am a free member again my results have been going back up. If this keeps up I may have to spring for another upgrade. That’s it for this month. Keep in mind that these stats are the result of my own marketing efforts and your results may vary. These stats are only provided as a guide to show you what is currently working best for me. What works best for you might be something entirely different but you will never know unless you are tracking your ads. You can get the same free link tracker that I use when you join TE Toolbox.